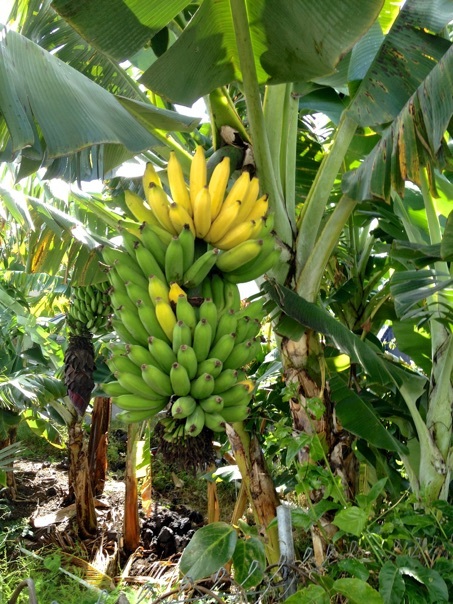 By some counts, there are 1000 varieties of edible bananas grown throughout the world, with over 100 grown in Hawaii. See all my banana photos. CLICK HERE for detailed Banana Descriptions PDF. As of 2017 I sell banana plants only to customers in bunchy top affected areas. I recently discovered some plants infected with bunchy top virus. While the obviously infected ones were removed, plants may be infected without showing symptoms. To avoid spreading the virus to areas that don’t have it, I am not selling plants except to those who know bunchy top is already affecting the area they plan to grow in. In those cases, keikis sold only come from mats without obvious symptoms but I cannot guarantee the plants don’t have bunchy top. Plants can be infected from 1 to 12 or more months without having symptoms. As each mat shows clear signs of infection it means completely eliminating the mat as even one infected plant nearly always means the entire mat is already infected. 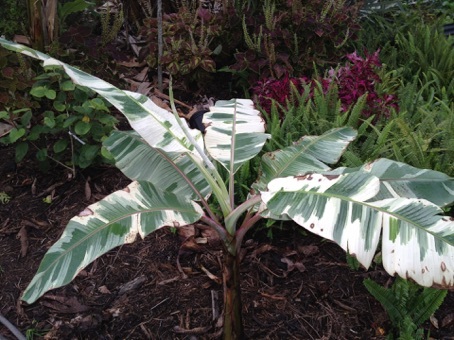 A limited selection of disease-free tissue-cultured banana plants can be found at nurseries and Home Depot stores statewide. Bunchy top affected areas include Hilo, Keaau, HPP, Orchidland, most of Kona and Kohala, and Seaview. If you live in these areas or otherwise know that plants near you are already infected, I’ll sell to you. Learn more about Bunchy Top Virus. Why bananas? 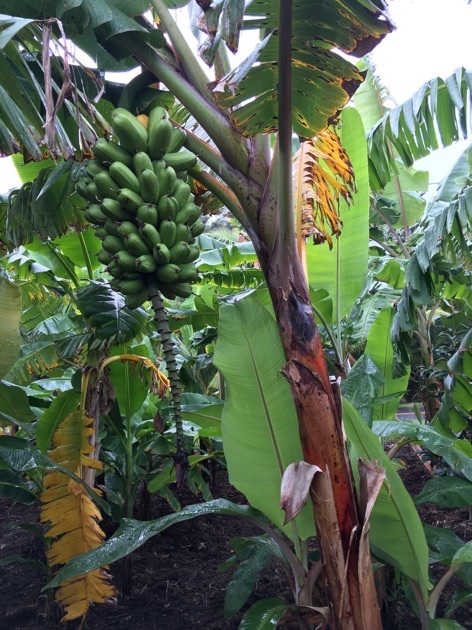 Compared to many other tropical fruits, bananas are easy to grow. 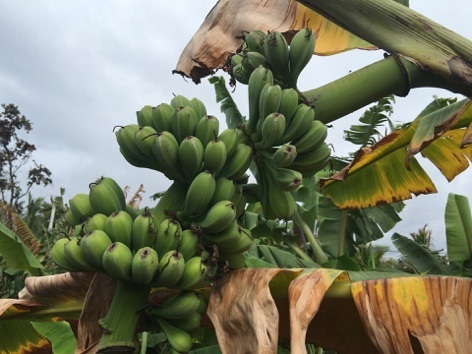 While many fruit trees (even grafted ones) may take years to produce, bananas generally produce a bunch within 2 years, then 1 or more bunches each year. 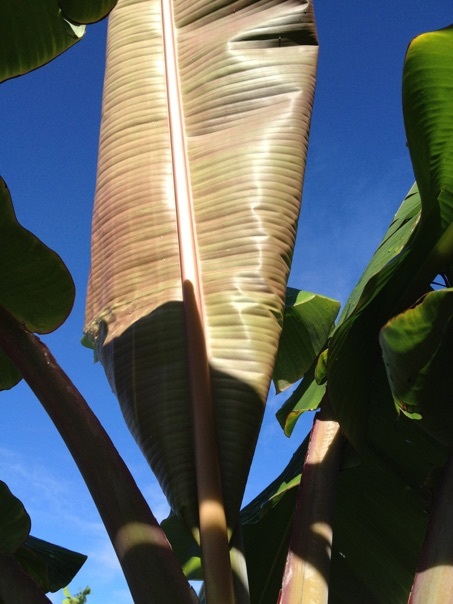 Bananas grow so quickly that you can even see changes in the same day as new leaves unfurl! They typically pay for themselves with the first bunch. 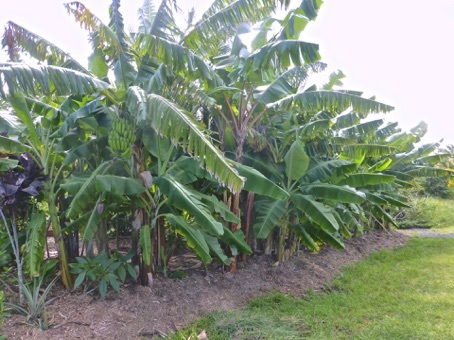 Why make hedges out of slow growing Podacarpus or Areca Palms when you can have a fast-growing edible hedge of bananas? 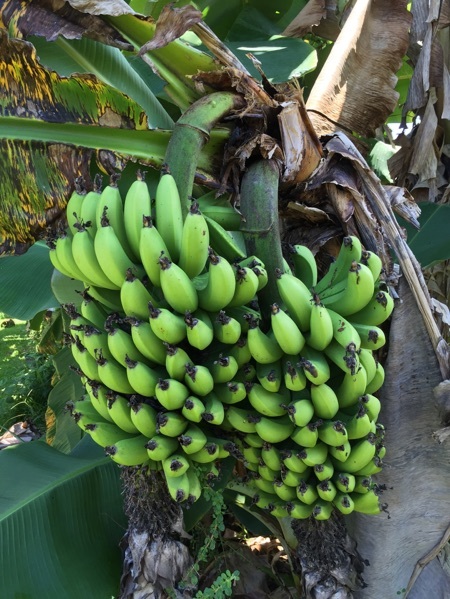 Bananas love Hawaii, and have been here as long as people have. 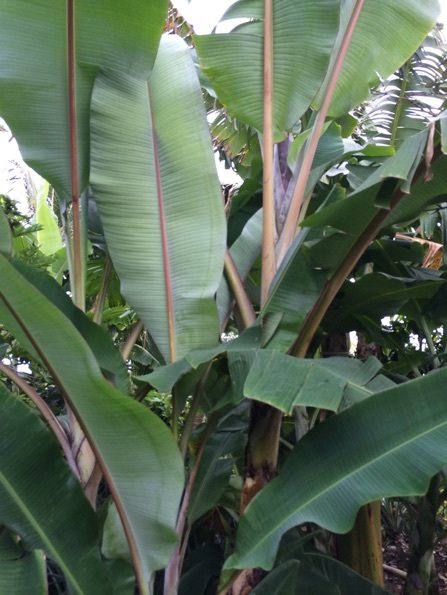 The first Hawaiians brought banana plants with them from their home islands. Unfortunately, the varieties they introduced are now somewhat to extremely rare. They are more disease-prone than many other varieties introduced in the past 230+ years. 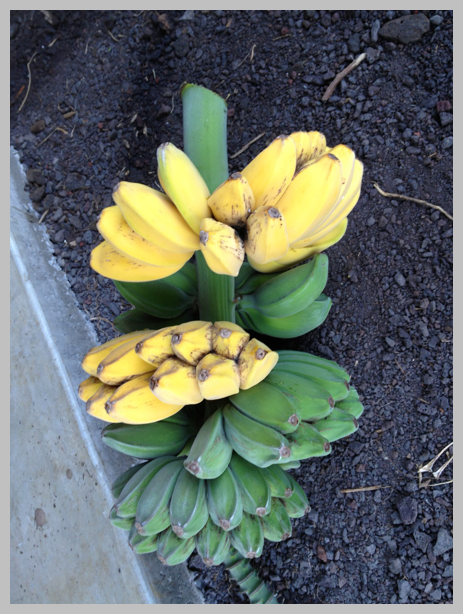 Help prevent the extinction of rare Hawaiian bananas by purchasing and growing them yourself! 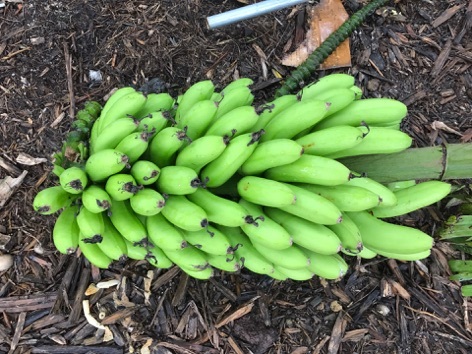 I sell all Hawaiian banana plants (except for A’ea’e) for half the price of my others to encourage people to grow them. 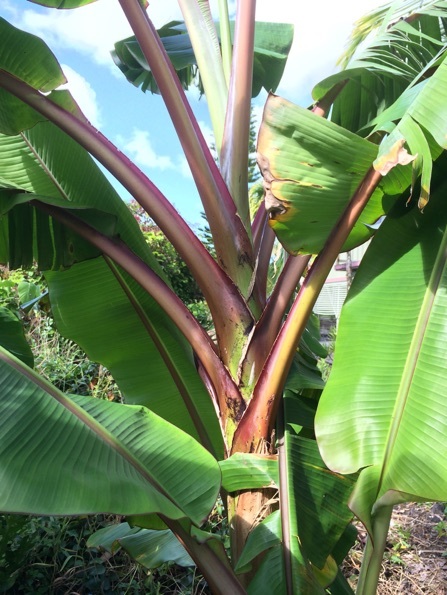 What do you want in a banana plant? Something particularly beautiful? A new variety to taste? Something short that is easy to harvest? Something tall to provide privacy? Something for cooking? 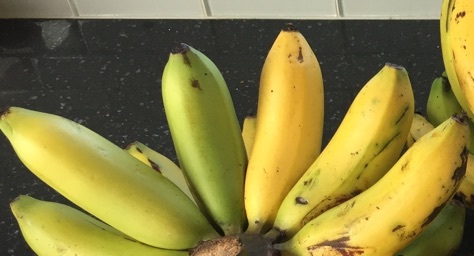 The diversity of bananas is simply amazing! These are the varieties I am most likely to have for sale. I will have many others as my farm matures. Keep in mind that banana names can be a bit of a mystery. Most collectors end up with plants much different than what they were sold as, plants that seem to have no known name, plants with a name someone made up and there is no information about online, or multiple plants called the same thing but quite different. For example, I grow at least 5 different plants that were all sold to me as Goldfinger, and none of them may be the real thing! I try my best to grow out and fruit plants before I sell them, include plant tags, and disclose when I am not completely certain about the accuracy of the plant name. 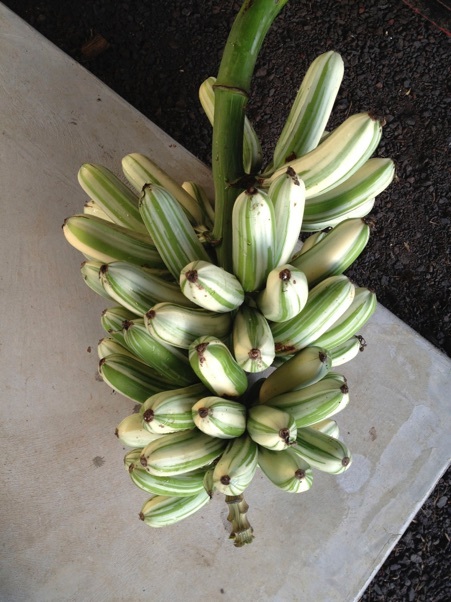 Banana fruit and plants cannot be shipped out of Hawaii. 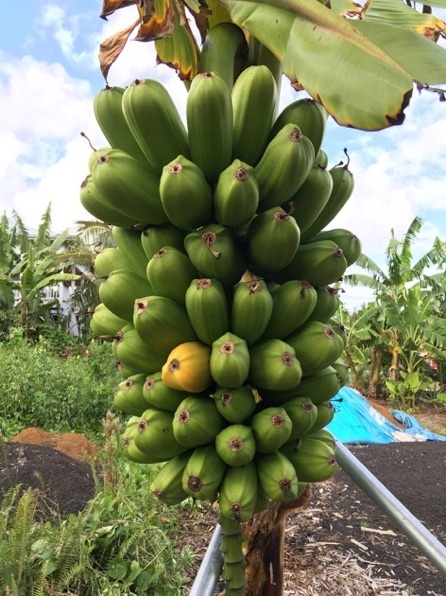 My all time favorite banana, and the most loved banana in Hawaii is also about the easiest to grow. It’s the Apple Banana. Technically, it is known elsewhere as Brazilian, Prata, and some other names. The true Apple is known in Hawaii as the Silk Fig (and elsewhere as Manzano) and is considered inferior and disease-prone. I sell Dwarf Apple bananas, not Tall. They are less prone to toppling over, and produce more quickly than Tall Apples. 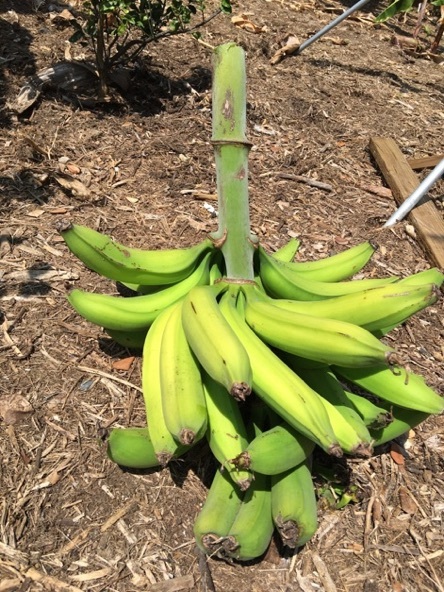 If you grow only 1 type of banana, grow the Dwarf Apple Banana. While it’s hard to choose a 2nd favorite, 3rd favorite, etc., three other types I strongly recommend are the Gros Michel/Bluefields, Mysore, and Namwah bananas. Ever had something banana flavored or scented and thought it didn’t really seem much like a real banana? Well, it is usually much like a Gros Michel! 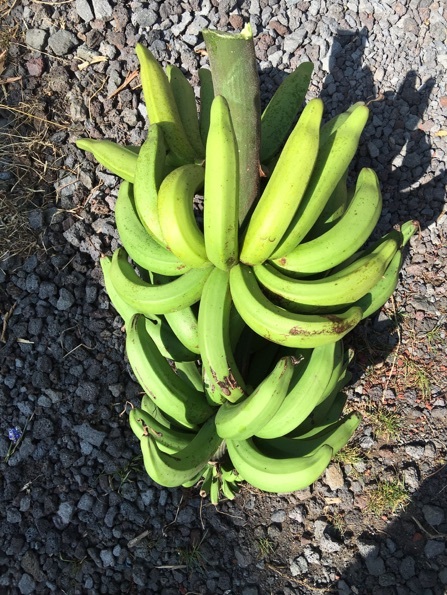 These bananas are also known in Hawaii as Bluefields. They are the original grocery store banana in the US and were available until the 60s to early 70s. Over time, plantations in Central and South America fell victim to the fungus that causes Panama Disease. They were replaced by Cavendish type bananas that do not succumb to this disease. Gros Michel look much like a regular grocery store Chiquita or Dole banana, but the difference is obvious as soon as you start to peel them. They have a wonderful, fruity fragrance that is similar to banana pudding or artificial banana scents. The texture is more firm than a cavendish, but still creamy. The flavor is like a cavendish that is sweeter, more complex, and far more delicious. We do have Panama Disease in Hawaii, and one would be foolish to try to start a Gros Michel farm. However, in your yard they are probably going to be fine unless you’re on land that was formerly a banana farm. I’ve been growing them for years without problems. Here’s an interesting article about banana flavoring and Gros Michel that I was interviewed for. The Mysore banana (sold by others as “Berry”) is the best selling banana in India for very good reason. It’s simply delicious, and is indeed reminiscent of berries. The fruit is smaller than the Apple banana, and more starchy at the same stage of ripeness. But if you wait until it is completely yellow, you’ll be rewarded with a complex, tangy taste that many rate as the best. The plant itself is taller than the Dwarf Apple, but not too tall. It’s also one of the most beautiful! The new leaves have reddish undersides, and the trunk is a mix of green, red, and black. Mysore seems to be generally pretty disease resistant. The Namwah banana is the best selling banana in Thailand. Available in both Tall and Dwarf versions. 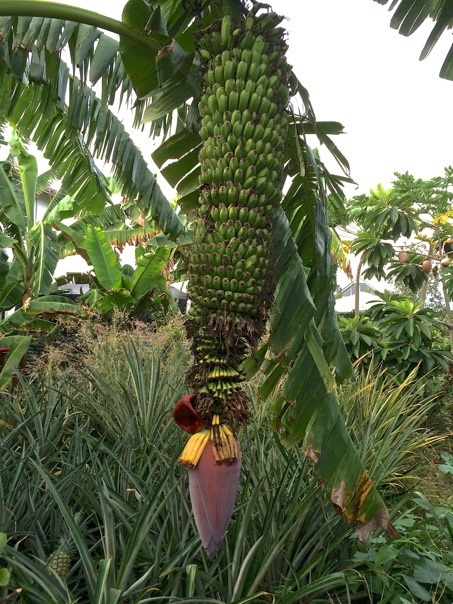 The bunches tend to be massive, with well over 150 fruit being common. The fruit themselves are more hearty and chewy than the Apple, but also have an apple-like taste to them, while tasting completely different than the Apple Banana. Also very disease resistant, they have beautiful green trunks with streaks of pink. The Dwarf Namwah has an especially thick, stout trunk. Some varieties with particularly interesting fruit shapes are the 1000 Fingers and the Praying Hands. 1000 Fingers is an all green plant with hundreds of small, tasty fruit. While many of the fruit are too small to bother with, they typically put out a good sized bunch worth of stubby fruit about half the size of Apple bananas. They have a unique taste and texture and make a great snack. They need more fertilizer than other bananas to make a large bunch. 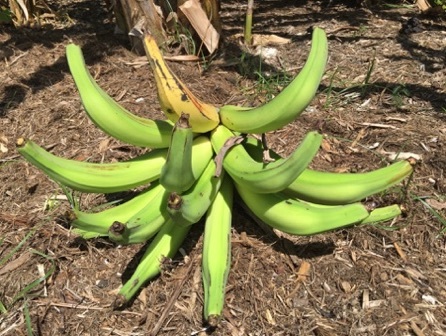 Praying Hands is an all green plant with amazing fused hands of bananas. 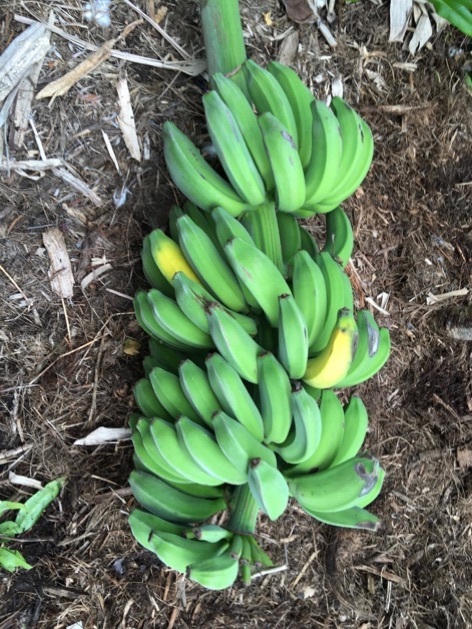 The bananas separate easily when ripe. It works extremely well as a cooking banana, being a Saba type much loved as a Filipino cooking variety. 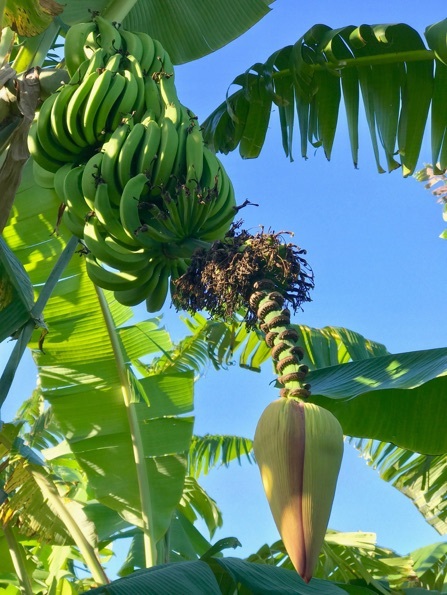 It’s also a unique and tasty dessert banana for eating ripe, with flavors of orange and peach. A firm, meaty texture makes it feel like eating something substantial. 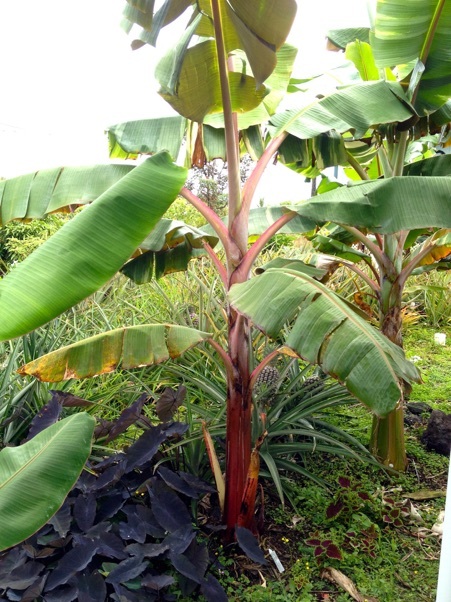 Some varieties that are especially beautiful are the Dwarf Red, Red Iholena/Iholena Lele, and A’ea’e/Variegated Banana. The Dwarf Red is the shorter, faster growing version of the Cuban (Tall) Red, with the same tasting fruit. The plant has lots of red and dark splotches, with a thick trunk. One of the slower growing varieties, it is still much faster to fruit than Tall Reds. The fruit has the texture of a Cavendish type, but with a more complex flavor that is hard to describe. The Red Iholena is a mutation of the rare Hawaiian variety Iholena Lele. The plant is all red on the trunk and undersides of the leaves. This makes it one of the most beautiful varieties. The fruit can be used for cooking or eating ripe. It is one of the fastest from flowering to ripe fruit. It has an apple taste to it, and the fruit is good ripe, but not especially so. The A’ea’e is also known in Hawaii as Koa’e and Manini, and elsewhere (incorrectly) as the Ae Ae. 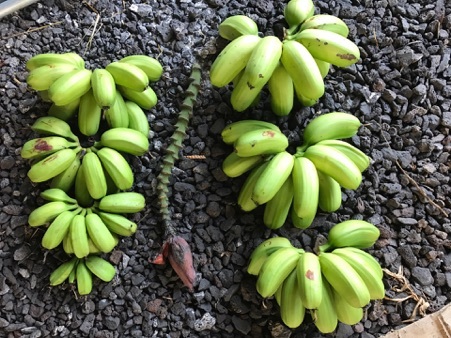 This banana is unique to Hawaii, a mutation of the green Maoli. It is considered the most beautiful banana, and is also one of the most expensive. Most bananas can be mass produced through a technique called tissue culture. However, when the A’ea’e is tissue cultured, it does not come out variegated. Therefore it remains rare. 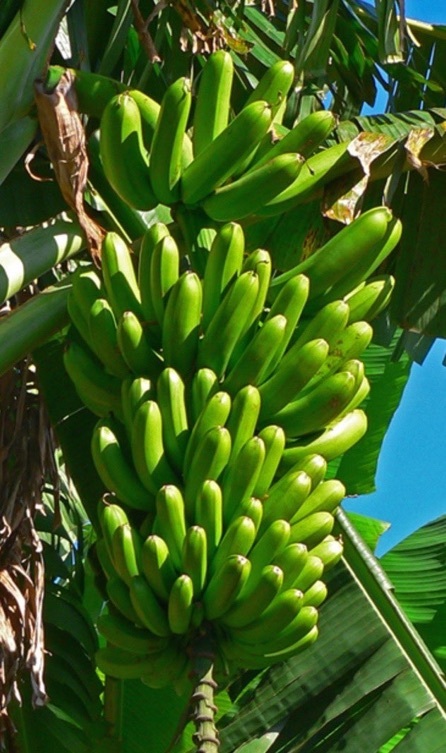 While decent eating as a ripe dessert banana, it excels as a cooking banana. $100 when available. If you love regular grocery store bananas, you will love the Lady Finger, Golden, and Double Mahoi. The Lady Finger is very much like a grocery store banana, with a more interesting flavor and a better, less pasty texture. It’s a Dwarf-sized variety, and looks much like a Williams, with lots of dark brown on the trunk. It tends to put out many fingers per hand, with over 30 on the first hand being typical. Many varieties are called Lady Finger, and they tend to be very different from each other. This one is not even a true Lady Finger type (like the Apple and Mysore). While Lady Finger fruits at 5-6 feet, Dwarf Ladyfinger fruits as short as 3 feet! The fruit on the Dwarf can be tasty, but the bananas are quite small. The Double Mahoi is an amazing plant that can put out 2 or more bunches from one flower stalk! It is a mutation of the Dwarf Cavendish/Chinese, and tastes the same. The first bunch will be single, but subsequent bunches may split into 2 trunks or have double or multiple bunches. If you dig up a keiki and replant it, that counts as a new first generation. 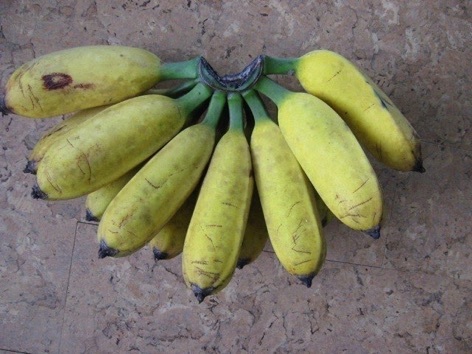 Similar in taste to a grocery store banana, though generally better when home-grown and harvested ripe. The Golden cavendish type is very similar to Dwarf Gros Michel in taste, texture and plant growth. Golden is a made up name chosen because of the much more yellow color of the flesh. I don’t personally like cavendish types very much, but I love the Golden! The Sucrier & Kluay Khai make small, super-sweet fruit. The Ice Cream/Blue Java is one of the most sought after varieties. 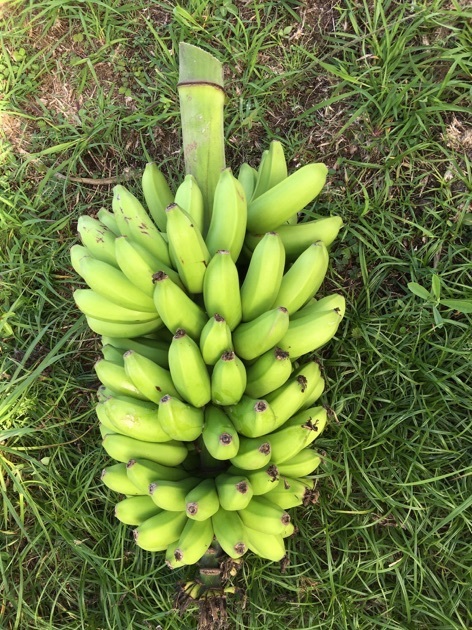 Though many in Hawaii consider it inferior, the true Ice Cream banana excels as a frozen ripe banana used in smoothies or blended as “ice cream.” The plant is a beautiful light green and the fruit are uniquely blue until they ripen as yellow. They can be less hearty than most other varieties and they always need to be propped up once they start to lean. Other excellent varieties are Tu’u Ghia, Goldfinger, Mona Lisa, Sweetheart. The most hearty, fast growing, and keiki producing cultivar I sell is Tu’u Ghia (or Gia). It is also one of the most delicious, with a somewhat cinnamon, very sweet taste and creamy texture. 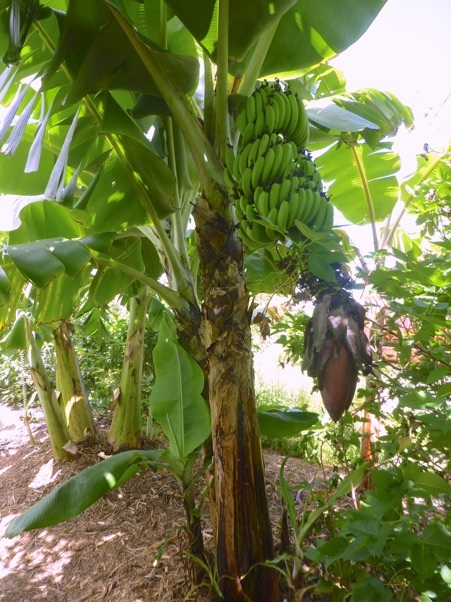 Where other bananas wither away, a Tu’u Ghia can be planted in the same spot and quickly take off and produce. I have had one plant begin to flower in only 6 months! Tu’u Ghia, along with Mysore and Gros Michel, is one of the types I encourage everyone to grow. The plant is also quite beautiful, with dark green color and red petiole edges. I grow and sell several types of FHIA, disease resistant hybrids. 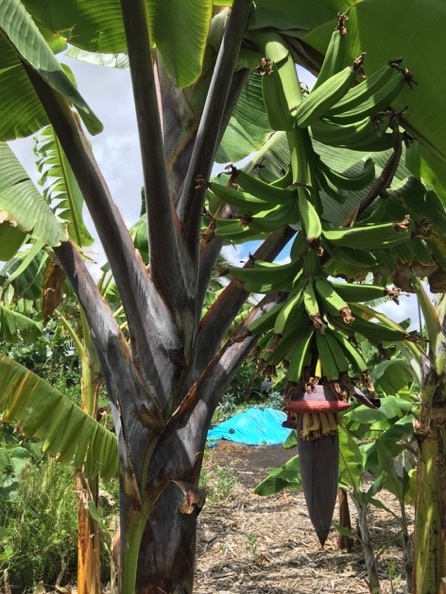 FHIA is a breeding organization in Honduras which has released several types of new bananas that have resistance to many types of diseases, and tend to produce large, tasty bunches. Goldfinger is FHIA-01, and is a hybrid of our Dwarf Apple banana and many others. It has a taste and texture similar to Apple bananas, but yet clearly distinct. There seem to be several variants being sold as Goldfinger, though none may actually be the real thing! All share a similarity in taste, height (a bit taller than Dwarf Apple), large bunches, heartiness, and producing many keiki. Goldfinger is another I encourage everyone to grow. FHIA-02 is Mona Lisa. It’s a hybrid of Williams and many others, though is far better than any cavendish types, and tastes nothing like them. It also tastes similar to Dwarf Apple in that it has a tangy taste, but has a unique texture, especially in the center where it is jelly like and almost juicy! FHIA-03 is known as Sweetheart. 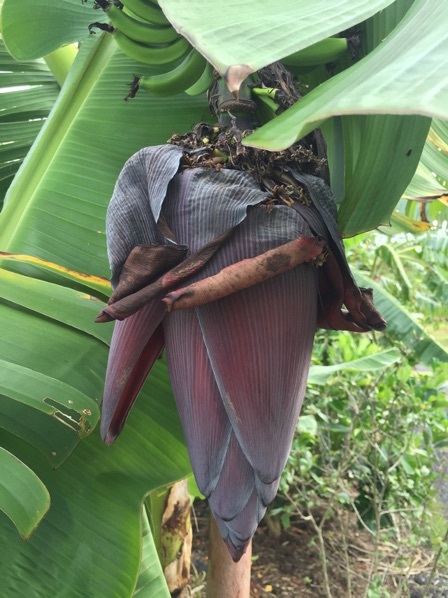 It was bred to be a cooking banana, but is actually much better as a ripe, sweet banana. If you like Ice Cream bananas, you’ll like Sweetheart. It has a similar fluffy texture, but a sweeter, more complex and interesting taste. It is short, stout, fast growing, with huge bunches, but very few keikis. Other FHIA types I grow and will eventually have for sale are 17 & 23 (Gros Michel hybrids) and 21 & 25 (Plantain hybrids). 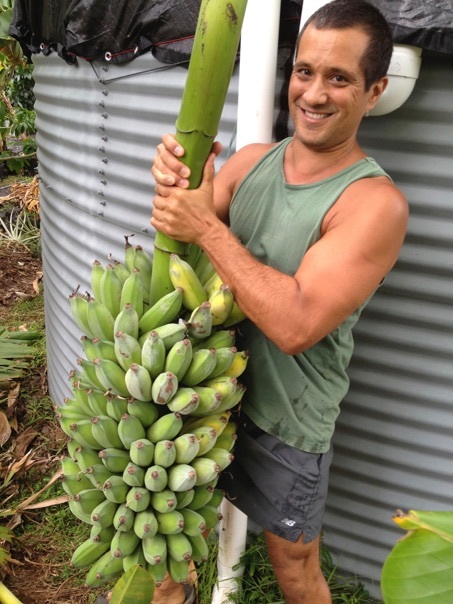 Help preserve endangered Hawaiian bananas (Mai’a) by growing them! I sell them for only $12.50, half the price of most others to encourage people to grow them. Nearly all the types the Hawaiians originally brought to Hawaii are close to extinction. Mai’a are culturally very significant to Hawaiians, as explained in wonderful detail in Kepler & Rust’s Hawaiian banana book. Some of the types I have, such as Maoli Honomanu, Maoli Hai, Maia Iholena, and Maia ‘Eke ‘ula exist naturally in only 1 or 2 remote locations outside of the handful of specimens grown in yards or botanical gardens. The 3 major types are Maolis, Iholenas, and Popoulu types. Each are best cooked with some yellow on the peel. Each also have flesh color from salmon to orange. 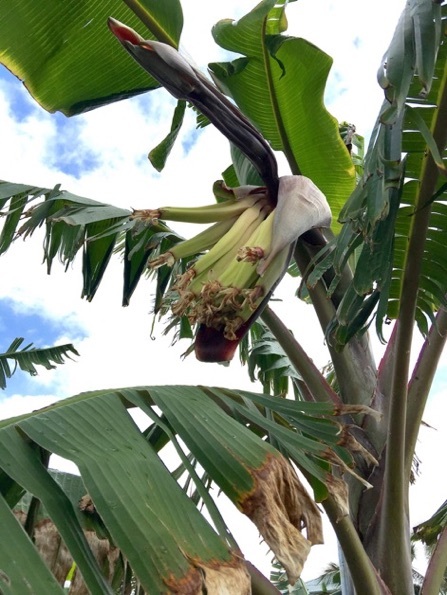 Unique amongst Mai’a is the Hapai, or pregnant banana that is known for having the fruit bunch form in the stalk where it must be carefully cut out! 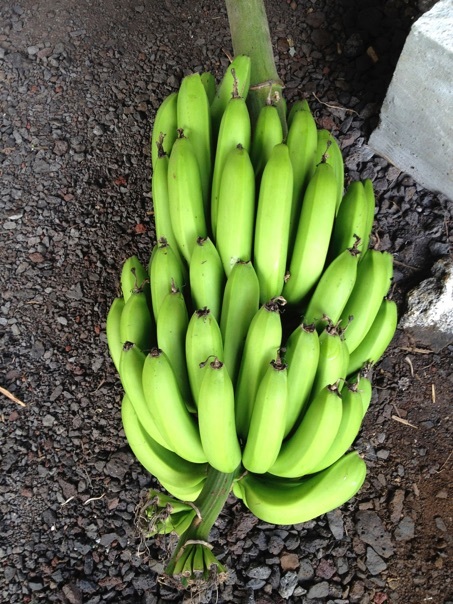 Maoli types are long, sausage-shaped bananas that are excellent cooked, but also quite good ripe and raw. Bunches tend to be huge and the plants are quite tall. Some Maolis are more red, like Manai Ula, while others are black (Ele Ele). Dwarf Kaualau is a shorter Maoli. All have a similar taste, though distinct. They are medium in starchiness amongst the Mai’a. Iholenas are beautiful plants, with red on the underside of most leaves. The least starchy, and most sweet of the Mai’a, they don’t hold up as well to cooking when ripe, but are excellent if not overcooked. Iholenas tend to be shorter than Maolis, with Mai’a Iholena (aka Iholena Iholena) being the shortest and flowering at 5-8 feet. Hua Moa is the most commonly found Popoulu type, making fruit as large as a papaya or larger! More starchy than the other Mai’a, they are also quite good raw, with an Apple banana-like taste. Popoulu types are medium height, and somewhat difficult to grow. They often have to be dug up, have the corm cleaned and bleach treated, then replanted in new spots to continue to survive. Cooking bananas are a delicious, sustainable option that are healthier than potatoes, rice, and pasta. 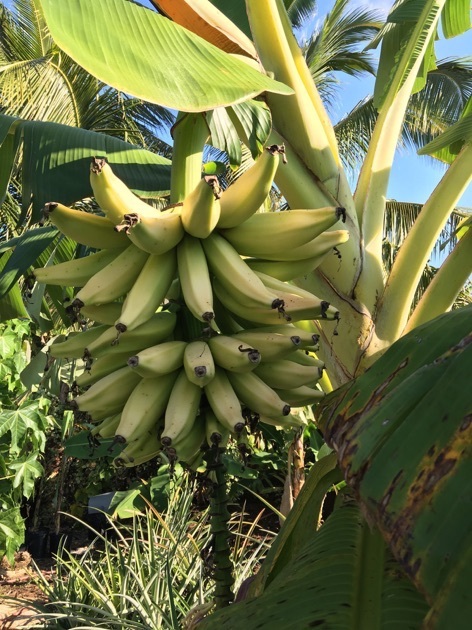 In addition to the Hawaiian banana families (Maoli, Iholena, and Popoulu) there are many kinds of cooking bananas or dual purpose bananas that can be cooked or eaten ripe. Cardaba, Silver Bluggo, Dippig, Kluay Hak Muk Khieo, Common Plantain, Dwarf Puerto Rican Plantain, Barraganete Plantain, African Rhino Horn Plantain, French Plantain, Largo, Monthan, and the Tongan Putalinga Kula, Putalinga Hina Nounou, and Feta’u Hina are all unique and all make excellent cooking bananas. Aside from the plantains, all cooking bananas can be quite good when eaten ripe and raw. The Ecuadorian plantain, Barragenete, is a tall, vigorous false-horn type that is the main plantain grown in the country that grows the most plantains. African Rhino horn is a gorgeous red plant with enormous plantains that can grow up to 2 pounds each and 2 feet long! Nang Phaya is a synonym for the Phillipine Lakatan, though in my collection is actually 2 completely different other bananas. 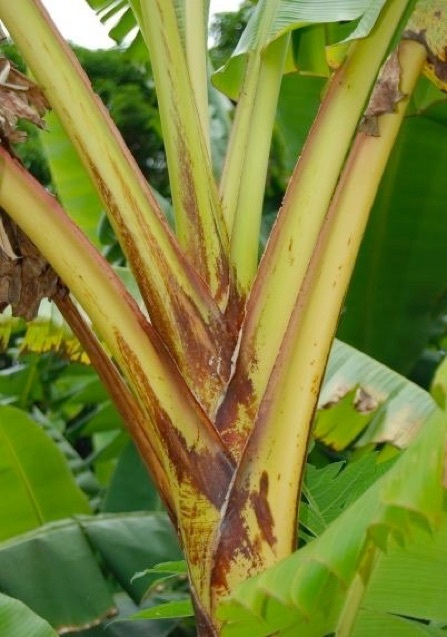 The sweet Nang Phaya makes an orange, very sweet banana that comes from a tall and vigorous plant. One of the best! 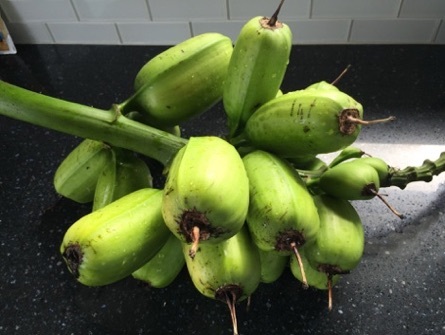 The other Nang Phaya makes much larger fruit which tastes like a cross between a Hawaiian Apple and cavendish banana. Green red is a green version of the Cuban Red. It fruits more quickly and the flavor is much less strong than in the Reds. While I don’t personally like the Reds, I do enjoy Green Red. Rose is a very small fruited, beautiful plant with lots of red, huge number of keikis, and a sweet, floral taste. Because of its habit of making many keikis, it is especially good as a hedge. 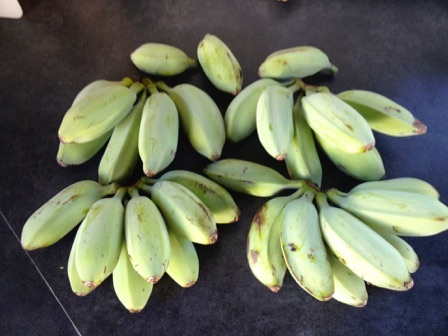 Muraru Mshale, Muraru Mulalu, and Huti Shumba Nyeelu are extremely rare African bananas that are green when ripe. They are somewhat similar to Gros Michel, though more complex with a bit more tangy taste and more starchy texture. 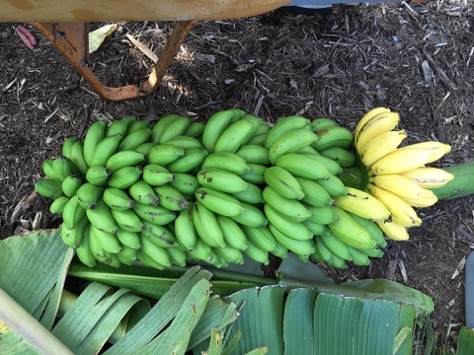 The Huti is the only banana I sell that makes a yellow male bud (the big, normally purple “flower” that comes after the fruit on the bunch). 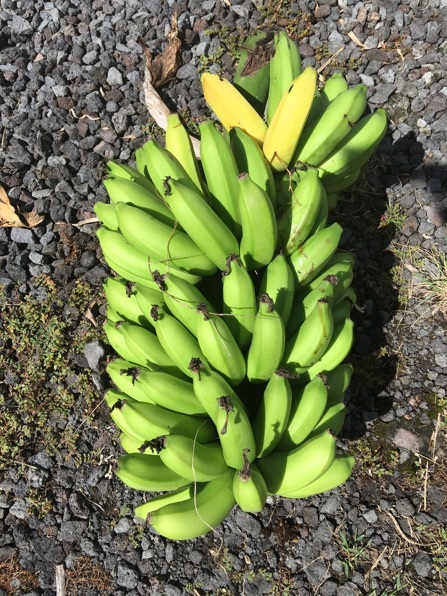 Bananas make an edible hedge! 1000 Fingers in Hawaii. More fertilizer = more fingers.